my kids love this podcast and it helps them brush their teeth so I love this podcast. What's a frog's favorite holiday? You'll have to listen to our holiday jokes to find out! What do you call a country's birthday? The answer is in tonight's holiday Chompers! We've got even more brand new holidays that you Chompions sent in to us! Today we're hearing about the awesome holidays you Chompions came up with! Today we are playing a game of What's That Sound? ... Can YOU figure it out? Where do horses live in a city? Find out the funny answer in today's jokes! What is this building that scrapes the sky? Shout it out on today's Chompers! Get ready to travel up in the sky on today's I Spy! Today's Chompers heroine was a great businesswoman, and even made a million bucks! Learn about Madam CJ Walker today. Today we've got TWO awesome heroines who fought for the disabled: Helen Keller and Annie Sullivan. Put your superhero cape on because its Heroines Week! Today's heroine is Xi Ling Shi. Jasmine is back with more answers to your JOBS questions on tonight's Chompers! Our friend Jasmine is back with an INTERVIEW. CEO and real kid Alina Morse answers your questions about JOBS on today's Chompers! If you chop and dice things, you might have this JOB. Find out what job we're talking about on today's RIDDLE-filled Chompers! This morning we've got a SONG for you ... where we finally reveal what grown-ups are doing all day at work! Can your ears figure out what gross sound we're playing? Find out tonight! Listen closely because it's Sounds Week, and we're starting with a quiz! Walter White Blood-cell is back to protect the body from an allergy invader! This time he has a new side kick -- Histamine!<br><br>But Histamine still has A LOT to learn. Check out today's STORY on Chompers! We're heading back to the doctor's office to play more I Spy tonight! Can you guess what body part we spy? Hitting your funny bone is no laughing matter! 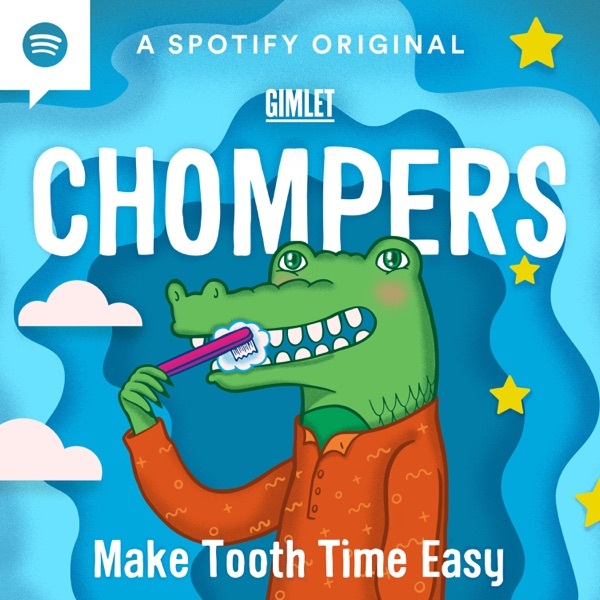 That's what tonight's SONG is about on Chompers! Your body has to get a lot done to keep you healthy and happy. And when you've got that much to do, you need a system! That's what our SONG is about today on Chompers! Hear the conclusion to this morning's Hausa folktale puzzle! Today we're traveling to Iran for our folktale. Listen to these robot noises to figure out WHAT'S THAT SOUND? Find out which one of our inventions was created by a kid on tonight's Chompers! We've got some reptilian pets for you on today's I Spy! See if you can figure them out! What's weirder than one episode about weird animals? ANOTHER episode about weird animals! You guys know a TON about animals - and that's what we're learning about today! Is BOTANY the study of boats? Find out on today's True or False! We're back in the science lab for tonight's I-SPY! Tonight's Chompers is bound to be GOUDA, because we've got more snack jokes! Tonight we're spying PLACES where you might find a tasty snack! Walter the White Blood-cell is back to protect the body from an allergy invader! This time he has a new side kick -- Histamine! What can you find on fish, measures weight, and is a part of music? Figure it out on today's Chompers! Tonight, the thrilling conclusion to Smash Boom Best's epic pizza versus taco debate!&nbsp; To hear more Smash Boom Best, find them on Apple Podcasts, or wherever you listen! Today on Friends Week on Chompers, meet our friends at Smash Boom Best! Smash Boom Best is the show that takes two cool things and DEBATES, to decide which is BEST! Today, host Molly Bloom pits Team Pizza against Team Tacos, with debaters Tracy Mumford and Marc Sanchez.&nbsp; To hear more Smash Boom Best, find them on Apple Podcasts, or wherever you listen! We're back tonight with Earth Rangers, and a fabulous quiz about FROGS!&nbsp; Earth Ranger Emma wants to know which of these frogs isn't real! If you'd like to hear more Earth Rangers, find them on Apple Podcasts, or wherever you listen! Today's show comes from our friend Earth Ranger Emma, at the show Earth Rangers!&nbsp; Earth Ranger Emma is going to give us a QUIZ! To hear more Earth Rangers, find them on Apple Podcasts, or whever you listen. Our friend Flora from Every Little Thing is back tonight with more wonderful and weird wombats!&nbsp; To hear more Every Little Thing, find the show on Apple Podcasts, or wherever you listen. Today's show comes from our friend Flora at the show Every Little Thing, because it's Friends Week! Flora has fun facts for you Chompions about WOMBATS!&nbsp; To hear more Every Little Thing, find the show on Apple Podcasts, or wherever you listen. Today on Chompers you'll meet Drake the Snake, an airplane pilot, who gets lost in snowy Antarctica! Got your thinking cap on? It's time for more animal riddles on tonight's Chompers! Guess which animals we're talking about with today's riddle-filled Chompers. Tonight we'll have WHALE too much fun with more animal knock knock jokes! Do bees even sleep?! Find out on tonight's Chompers, when we SING about bee bedtimes. Tonight we're exploring the ways animals -- like elephants, snakes and birds -- use their senses! What food is like mold? Find out with more tangy, tasty riddles on tonight's Chompers! Get ready for some YUMMY food-filled riddles on today's Chompers! Time to tickle your funny bone with today's tasty knock knock jokes! What's the word for a plant that eats bug? Find out tonight on Chompers! It's Food Week on Chompers, and today we’re going to find out about all the amazing ways that PLANTS eat! Today we've got a brand new SONG -- about all the things you didn't know were FRUITS! It's Interview Day on Chompers and today we have a special space expert to answer YOUR questions about space! What do you use to see distant places? Figure it out on today's space riddles! Can you figure out what place in space we're talking about? Find out on tonight's I Spy. There are two types of planets in our solar system! And to help you keep them straight we've got a SONG for you! Tonight we've got the answer to our spaced out quiz: Which planet is the BIGGEST? Jupiter, Saturn or Mercury? Will Bruce the Airplane and Birdie the Helicopter work together to help Champ City? Find out in tonight's STORY episode of Chompers! Birdie the Helicopter wants to help Champ City, but will the airplane bullies at school let her?? Find out in today's STORY filled Chompers! Gallop, Canter, and Trot. What do these words have to do with transportation?? Find out on today's Chompers! It's RIDDLE day on Chompers, and today's head scratchers will take you out of this world! Knock knock. Who's there? Today's joke filled episode of Chompers! We're CRUISING right along on tonight's WATER TRANSPORTATION filled Chompers! Hitch a ride on a river boat for today's Chompers because it's all about WATER TRANSPORTATION! Keep your brush in your mouth and your eyes on the sky: Today's Chompers is all about AIRPLANES!!! What happens when Walter the Leukocyte pushes the mysterious green button? Find out the dramatic conclusion on tonight's story. Can you figure out which animal throws poop with its TAIL?! Find the gross culprit on tonight's Chompers. What gross animal pukes on its food?! Find out on today's riddle-filled Chompers! Get ready for some gross giggles with today's knock knock jokes on Chompers! Pickles, soy sauce, olives -- what do these things have in common? You'll find out on tonight's Chompers! What is bacteria? Is bacteria ... good for you? Today we find out on Chompers! Find out what gross things your CAT and DOG do, on tonight's Chompers! What animal THROWS UP when it's scared? Find out that, and more, on today's Chompers! We're going for seconds in this episode with MORE wacky treats you like to eat! Shout out to the Chompions who sent us the weird and wild grub you love! What's weirder than one bonus animals episode? ANOTHER bonus animals episode! Thanks to all our Chompions for the amazing animals you submitted! Make tooth time easy with this morning and night tooth brushing show for kids.<br><br>Kids will hear jokes, riddles, stories, fun facts, silly songs and more, that’ll keep them giggling - and brushing - for the full two minutes that dentists recommend.<br><br>Chompers will have <em>kids</em> reminding <em>parents</em> that it's time to brush, not the other way around!<br><br>Recommended for tooth brushers ages 3 - 7.&nbsp; Also available on Amazon Alexa. When it’s time for your family to brush teeth, say “Alexa, start Chompers."